This article appeared on The Guardian's website on January 3, 2017. To read the article there, click here. Several owl species sit tied to a makeshift wooden perch as a TV plays a loud, animated owl-themed film behind them in the dimly lit room. This is Tokyo’s Forest of Owl cafe, filled with locals and snap-happy tourists even on a weekday morning, and as the countdown to 2017 begins, its resident owls will be petted and photographed by more Japanese customers than usual as people seek good fortune for the New Year. Fukurō – the Japanese word for owl – means good luck or protection from hardship. Here, owls aren’t merely lucky, they’re cute, or kawaii, which is a culture all on its own in Japan. The Akiba Fukurou cafe website promises customers a relaxing experience and claims owls are like therapy for “tired hearts”. But bird of prey experts warn that owls make terrible pets and welfare groups consider cafe conditions questionable, if not abusive. Rob Laidlaw, executive director of the charity Zoocheck, says animal cafe environments can cause “chronic stress, negative emotional states, and deteriorating physical health”, which could cause owls to bite or scratch visitors. Though owl cafe practices vary in Japan, with only some allowing petting, animal rights groups believe many of them violate legal welfare requirements by restraining owls with ropes and disrupting natural sleep cycles by keeping them awake during the day. Japan’s welfare laws offer limited guidance but improvements may be on the horizon, says Sayoko Yamada, director of the Kanagawa Society for the Prevention of Cruelty to Animals. Yamada predicts legislators will amend Japan’s animal welfare laws by 2020, anticipating international scrutiny accompanying the 2020 Olympics. It is believed that Japan passed its first animal welfare legislation in 1973 just in time for a visit from Queen Elizabeth II. For the time being, animal cafes are on the rise in Japan. According to the website Where in Tokyo, the Japanese capital has 48 animal cafes featuring a range of inhabitants, from cats and dogs to birds and snakes. Fourteen of Tokyo’s animal cafes are bird-centric. 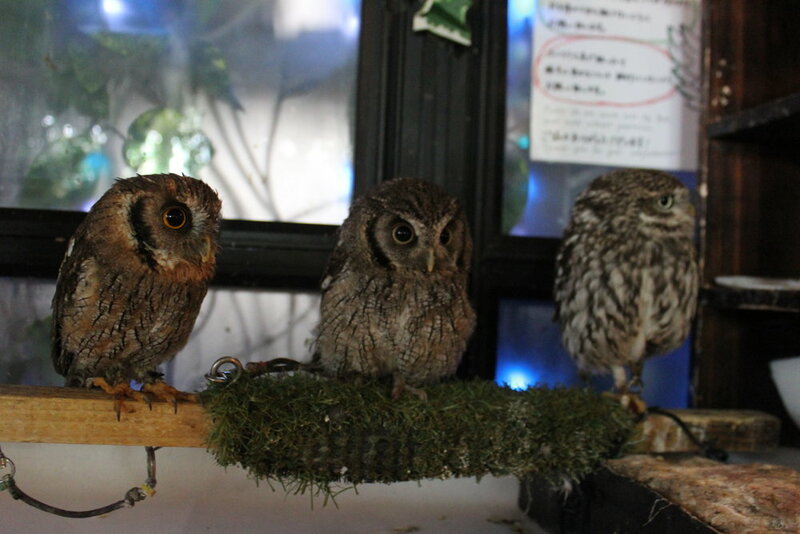 At least half of Tokyo’s eight owl cafes opened in the last two years. Some believe the surge stems from Japan’s obsession with trendiness – cat cafesare now so abundant, they’re passé – but owl popularity is also linked to the popularity of Harry Potter. In the UK, where pet owls are legal, ownership was negligible prior to the publication of the Harry Potter books, spiked during the height of the series’ popularity, and dropped off by the time the final book Harry Potter and the Deathly Hallows was published. Once people realised the cost and complexity of caring for an owl, they abandoned their feathered pets. JK Rowling publicly denounced the practice of keeping owls as sanctuaries had to make room for neglected animals. But in 2015, 60,000 Londoners bid for the chance to visit a pop-up owl cafe that promised to donate proceeds to an owl charity. Japan’s attractions do not claim to advance conservation. Animal experts acknowledge that cafes may foster animal appreciation but say they are more likely to inspire customers to buy pet owls than donate to animal welfare. Sumo Yamamoto, a Japanese owl expert, does not consider the trend for owl cafes an immediate threat to the conservation of owl species as most birds on display are bred in captivity, either in Japan or abroad. However, chicks stolen illegally from the wild sometimes end up in legal markets. In 2014, a Belgian court convicted four traders of forging trade permits for endangered species to make chicks caught in the wild appear to be captive-bred; the traders were part of a larger crime syndicate involved in fraudulent bird of prey trade throughout parts of Europe and the UK.